Daily Illuminator: Munchkin Collectible Card Game Tournament And Learn To Play Events At PAX South! January 3, 2018: Munchkin Collectible Card Game Tournament And Learn To Play Events At PAX South! If you're going to PAX South, you'll have a chance earlier than just about anyone to play the Munchkin Collectible Card Game! Join us to get a jump on our upcoming two-player experience, designed by award-winning game creators Eric M. Lang and Kevin Wilson. This collectible game isn't Munchkin. 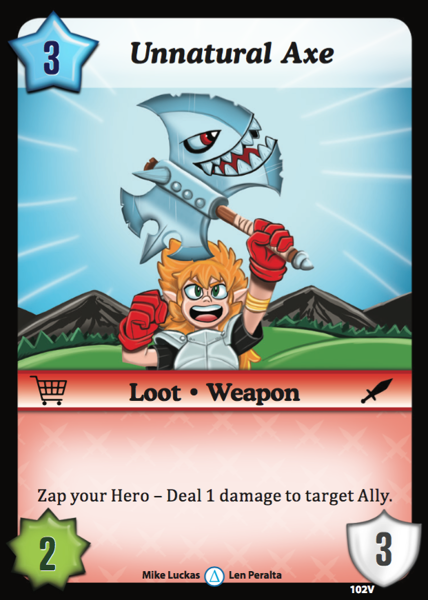 Instead, it's like a bunch of heroes from the Munchkin universe decided to go do their own thing, where they get together to beat each other up in one-on-one combat using entirely different rules (but some of the same weapons; see the Unnatural Axe pictured here). These cards are collectible, coming in three two-deck starter sets and randomized booster packs. Interested? You can participate in any of four how-to-play events at PAX South; learn how the Bard, Cleric, Thief, Ranger, Wizard, and Warrior throw down. Just for coming, we'll send you away with one of two alternate-art cards you can only get through Munchkin Collectible Card Game Organized Play events. Then, you can test your new skills in our first-ever Munchkin Collectible Card Game tournament! We'll give entrants a free starter deck, to play during the tournament and to take home after! Winners will receive booster packs, plus an alternate-art prize card! To sign up, visit Tabletop HQ on the day of the event and register. Make sure you get there early; there are limited seats! Learn To Play: 1 p.m. to 3 p.m. Learn To Play: 4 p.m. to 6 p.m. Learn To Play: 11 a.m. to 1 p.m. Learn To Play: 1:30 p.m. to 3:30 p.m. Tournament: 4 p.m. to 8 p.m.
Let us know on social media if you'll be there by using #PlayMunchkinCCG, and we'll share your post! In the meantime, get ready with some how-to-play videos, the quick-start rules, and these strategy articles.